We offer classes morning, afternoon and evening at our beginner dance studio in Charlotte, NC, so you can certainly find a class that fits your busy schedule. If you are thinking about the possibility of taking up dance lessons for yourself, you may be worried about any number of factors, such as age, ability or safety—to name a few. Or perhaps you have a child who has just discovered the wonderful world of dance and is excited to start dance lessons as soon as possible. Whatever your situation, at Carolina Dance Capital, we offer beginning dance lessons in our beginner dance studio for anyone who wants to experience the elation of dancing, beginning at age 2, all the way through adulthood. If it is adult dance classes you are looking for, we are pleased to offer ballet, tap, jazz and ballet barre / conditioning. 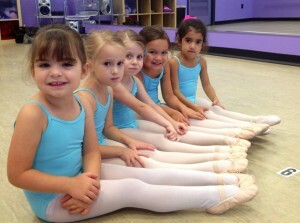 If your child wants to dance, we offer ballet, tap, jazz, lyrical and hip hop at our beginner dance studio. We have a number of instructors who are able to teach each different genre. In fact, our instructors have a combined total of over 100 years of dance experience, which means you get the best instruction available in Charlotte, NC. Additionally, we keep our class sizes intimate so that each student is given personalized attention and the ability to improve and excel in the areas that are most needed. Keeping our class sizes small also allows your child to form lasting friendships with other members of their class, and you can get to know other dance parents. In our adult classes, you can also meet lots of new friends. This way, you can both offer and receive encouragement when you need it. Our dance instruction is focused, fun, and engaging, which is why most of our students start at a young age and continue on through high school. We offer classes morning, afternoon and evening at our beginner dance studio, so you can certainly find a class that fits your busy schedule. Regardless of whether you are interested in a beginner dance studio for yourself or your child, come in and take a look at our state-of-the-art facility today. Our studio is in a safe and convenient location, close to shopping, restaurants and entertainment, which offers you the ability to complete other tasks while your child is dancing. We value your safety and security, which is why we have installed 2-way observation windows and true injury prevention floors. Our facility offers a fun, family atmosphere along with annual recitals where dancers can showcase their abilities. We’d love to have you become part of our dance family today. At Carolina Dance Capital, our beginner dance studio welcomes students from Charlotte, Matthews, Weddington, Waxhaw, Gastonia, and Pineville, North Carolina, as well as Fort Mill and Rock Hill, South Carolina.